The long awaited Department of Housing report into the Millfield Manor in Newbridge, Co Kildare fire in March 2015, where 6 homes burnt down in less than a half an hour, has been further delayed. 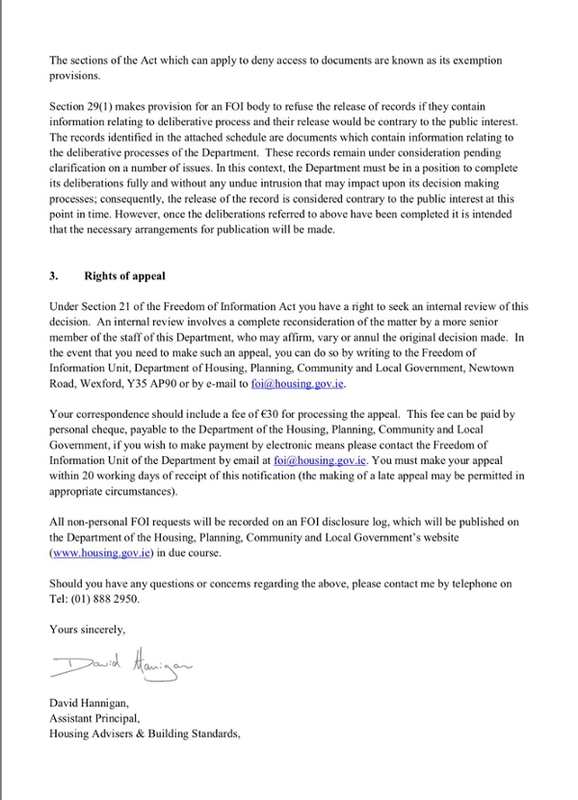 A recent Freedom of Information request requesting the report, submitted by Eoin O’Broin TD (SF) was refused. 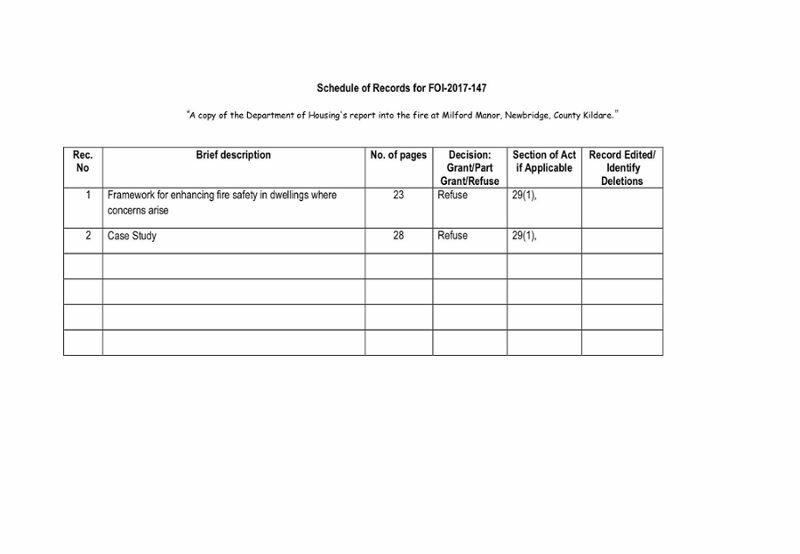 The request related to two documents, a 28 page case study on Millfield Manor and a second 23 page report “Framework for Enhancing Fire Safety in Dwellings where Concerns Arise”, a document intended to report on broader measures and give recommendations for other similar defective schemes. 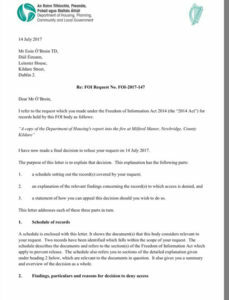 The grounds for the refusal were that the reports “contain information relating to the Deliberative process of the Department” and consequently the “release of the record is considered contrary to the public interest at this point in time”. The refusal is signed by David Hannigan, Assistant Principal, Housing Advisors and Building Standards. This entry was posted in Building Regulations on July 20, 2017 by BRegs Admin. 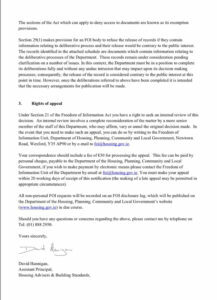 It’s pretty jaw dropping that the reason given for the refusal to release documents is “release of the record is considered contrary to public interest at this point in time”. 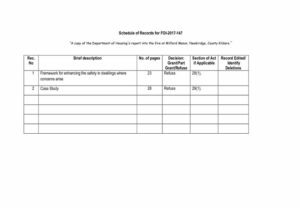 Considering the importance of what this deals with – the lives of people unfortunate enough to find themselves living in buildings with high fire risk, as the residents of Millfield Manor, Newbridge and the Holywell Apartments, Swords – I would have thought there was no greater public interest than that! It’s beyond belief to think that politicians are looking after their own self interests before the lives of the citizens of the country! Shocking! What are they trying to hide? This decision is an indictment of the “circling the wagons” mentality of this minority government and their morally bankrupt civil and public servants. A total disgrace!